Brugmansia x ‘Yellow’ is a tropical bush native to Columbia to Ecuador that can get 15 to 30 feet in height and 6 to 12 feet wide. The flowers are a buttery yellow color and are trumpet shaped with edges that roll back and form tendrils. The flowers are very fragrant and are strongest in evening making it attractive to moths and night pollinators. Angel’s Trumpet is also very attractive to bees, butterflies and birds. 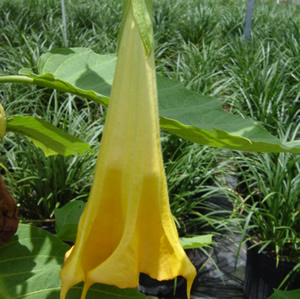 Angel’s Trumpet can bloom repeatedly year round when protected from frost.